Van Marissing discusses Webster with WTC Today. Webster Leiden director Jean Paul van Marissing is on the cover of the Spring 2016 issue of WTC Today, the publication of World Trade Center Amsterdam. "...the classes are small and interaction between teacher and students is key. 'It is an American approach,' he says. ‘You have to prepare for your classes and you do a lot of working together with others on assignments. Our students and staff have very diverse backgrounds so it is a global learning experience. You can be talking about doing business on the African continent with students from various African countries, for example. So you get a completely different sort of discussion.’"
Read the full article beginning on page 6 here [PDF]. Webster chess head coach Susan Polgar was the guest on the KTRS 550 morning show April 6 with Martin Kilcoyne and Randi Naughton to talk about the Webster chess team's fourth consecutive national championship in collegiate chess. Kilcoyne is the sports director at Fox 2 in St. Louis, while Naughton is a news anchor on the St. Louis Fox affiliate. 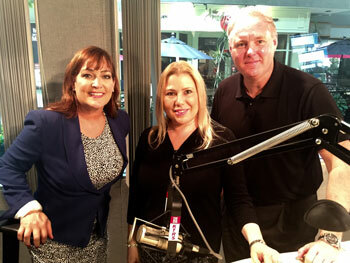 Their popular morning show covers a variety of topics in the region. Their conversation with Polgar covered the strategies and coaching tactics she uses with her top-ranked players, including the research players conduct on their opponents, as well as the physical fitness and mental training the students use to prepare for tournaments that can include 10-12 hours of intense concentration. Polgar and the chess team returned from New York, where they won Webster's fourth consecutive President's Cup national championship last weekend.